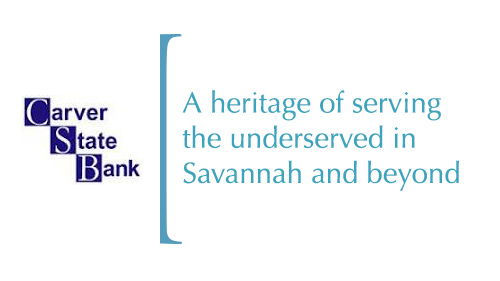 Carver State Bank has a tremendous heritage within the Savannah-Chatham County area as an innovative financial service leader for more than 80 years. Carver has thrived because of its loyal customers and the astute judgment, leadership, and hard work of its Directors, management, and other employees. Carver is a member of the National Bankers Association and Georgia Bankers Association. Carver is the only bank headquartered in Savannah that is certified by the United States Treasury Department as a Community Development Financial Institution. Carver State Bank is currently one of only 28 African- American-owned commercial banks in the United States. Carver State Bank has remained a financial services leader for all sectors of the Savannah community throughout its 85 years and is the only bank in the area with an OUTSTANDING Community Reinvestment Act Rating.